Contract Details: 1 year initial contract. Signed 2 year extension on 8th February 2013. Highlight: Scored his first goal for the Wanderers against Perth Glory, Round 7, Season 2012/13 on 18/11/2012. 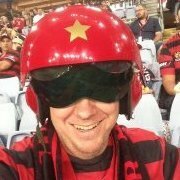 Highlight: Received a record suspension for a Western Sydney Wanderers player, after his 4 match ban for elbowing a Sydney FC player in the 3rd Sydney Derby. Highlight: Received the Joe Marston Medal as a joint winner with Thomas Broich, for being best on the field in the 2013/14 A-League Grand Final. Description: Iacopoo La Rocca is an Italian Defensive Midfielder who spent several years in Switzerland before moving to Australia. He has the ability to play in Midfield and Defence and was rotated in an out of those positions as required. Time to bring him back. I remember him saying he disliked being coached under Popa, so Popa has to leave first before he comes back. Hmm does that mean, he is automatically no longer a foreign player?